The iconic, two-seat roadster just got even better. With a fully-updated engine guaranteed to pack more power and more fun, the all-new 2019 Mazda MX-5 Miata RF in Las Vegas, NV is an automotive masterpiece. 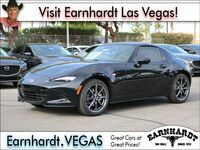 With a wide range of trim levels and features, few vehicles can compete with the 2019 Mazda MX-5 Miata RF at Earnhardt Mazda. Drivers looking to get behind the wheel of the 2019 Mazda MX-5 Miata RF will have four performance-ready styles to choose from – Grand Touring 6MT, Grand Touring 6AT, Club 6MT, Club 6AT – starting at just $32,345. This hard-top convertible is Mazda’s most powerful two-seater yet, equipped with 17 percent more power than previous models. What Are the 2019 Mazda MX-5 Miata RF Design Specs and Features? Are you looking for the fun of a soft top but the security of a fixed roof? The 2019 Mazda MX-5 Miata RF’s hard-top roof retracts in just under 13 seconds, tucking neatly away without reducing any amount of trunk space. This vehicle is guaranteed to catch the eyes of those around you, whether you choose to wear the top up or down. Armed with a SKYACTIV®-G 2.0-liter engine, the 2019 MX-5 produces 181 horsepower at 7,000 rpm. The 2019 model is an upgrade of 26 horsepower and more torque over last year’s model. Stand out from the crowd with three different premium exterior color options – Soul Red Crystal, Machine Gray Metallic, and Snowflake White Pearl Mica. MX-5 Grand Touring models are equipped with automatic climate control; a 9-speaker audio system; Blind Spot Monitoring with Rear Cross-Traffic Alert; Lane-Departure Warning; 17-inch dark silver wheels; and more. The MX-5 Grand Touring 6MT model can be upgraded to the GT-S Package, equipped with the SKYACTIV®-MT 6-speed manual transmission along with a hand-painted black roof. Buyers leaning toward the MX-5 Club models will find Metallic Black alloy 17-inch wheels; a 9-speaker audio system; heated cloth seats; and more. MX-5 Club 6AT can be upgraded to the i-ACTIVSENSE® Club Package, providing the vehicle with enhanced safety features such as Smart City Brake Support. Drivers looking for a manual transmission option in the Club models can find the Brembo/BBS Package and the Brembo/BBS/Recaro Package. The Brembo/BBS Package features red-painted brake calipers; 17-inch, dark gunmetal BBS forged alloy wheels; sleek heated leather seats; and more. The new Brembo/BBS/Recaro Package includes a black-painted roof along with heated Recaro buckets. This 2-door convertible is guaranteed to turn heads no matter what style you choose. 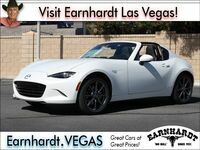 Visit Earnhardt Mazda today to get behind the wheel of the new 2019 Mazda MX-5 Miata RF in Las Vegas, NV!